The Theory of Quantum Matter Unit carries out research into a wide range of problems in condensed matter theory, with a strong emphasis on the novel phases and excitations found in frustrated magnets. Recurring themes include quantum and classical spin liquids, especially those where topology plays an important role. This work is described in the Annual Reports listed in the menu on the left side of this page. Reports are designated by the Japanese financial year, with FY 2017 running from April 1st 2017 until March 31st 2018. Some of the more recent projects are described below. Electromagnetism is one of the most well-understood phenomena, and its mathematical description is one of the most elegant and charming chapters in theoretical physics. Recently, condensed matter physicists realized that, when considered as an emergent effective theory in many-body system, electromagnetism can be extended beyond its conventional form, and takes a matrix as its electric field, dubbed "rank-2 U(1) theory". It leads to various exotic behaviors, including having "fracton" excitations that cannot be moved by local dynamics. In this work, we try to bridge the gap between the fantasies of such theory and the realistic world of frustrated magnets. We proposed a model based on breathing pyrochlore lattice with interactions motivated by existing materials. With analytical and numerical studies we show that in such a model harbors the rank-2 U(1) physics at its low energy. Explicit predictions for experiments are also made in this work. The four-fold pinch point in correlation function is the distinctive signature of rank-2 U(1) physics. There is now a growing interest in rich non-trivial magnetic structures known as “multiple-q states” which are coherent superpositions of states with different ordering wavevectors. One of celebrated examples might be the “skyrmion-lattice state” which is often stabilized in the system with antisymmetric Dzyaloshinskii-Moriya (DM) interaction. Motivated by a theoretical study for the emergence of a frustration-induced symmetric skyrmion-lattice state in a triangular-lattice Heisenberg magnet without DM interaction, we investigate the ordering properties of the classical J1-J2 honeycomb-lattice Heisenberg antiferromagnet under magnetic field (Fig. 1) by means of a large-scale monte carlo simulation, a low-temperature expansion and a mean-field analysis. 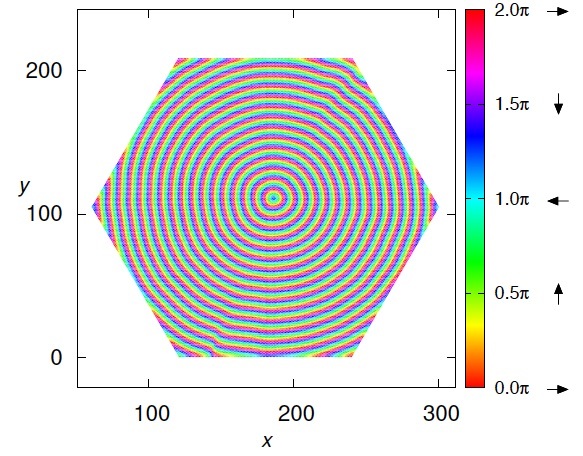 It was reported that the classical ground state of the honeycomb-lattice system has an infinite ring-like degeneracy in the wave vector space (Fig. 2) and this degeneracy could produce exotic cooperative paramagnetic states called by "ring-liquid state" and "pancake-liquid state" at moderate temperatures under zero magnetic field. 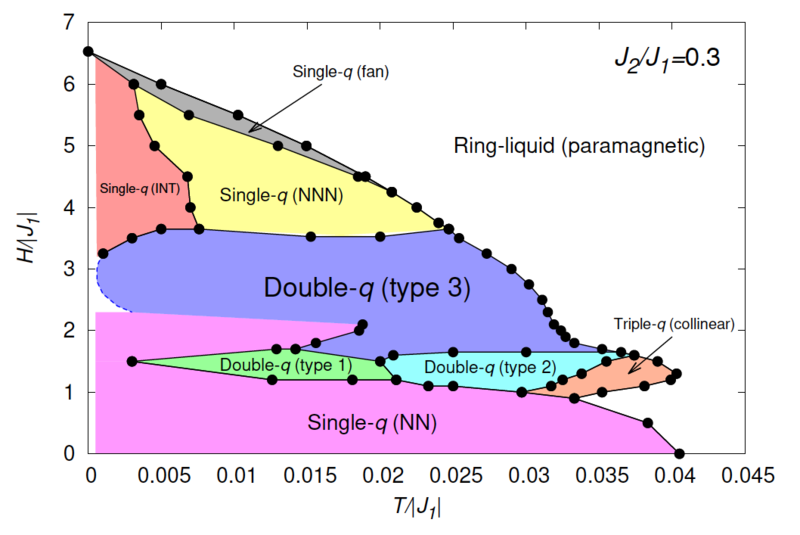 In our manuscript, we find that the ring-like degeneracy could be a source for a rich variety of multiple-q states including the single-q (umbrella and fan types), double-q (coplanar and non-coplanar types) and triple-q states (collinear type), at moderate temperatures under magnetic fields (Fig. 3). One of the double-q state, double-q (type3), has meron/antimeron-like spin textures. We also discuss the possible origin of the various multiple-q states observed in our MC simulations within a mean-field analysis and a low-temperature expansion method. 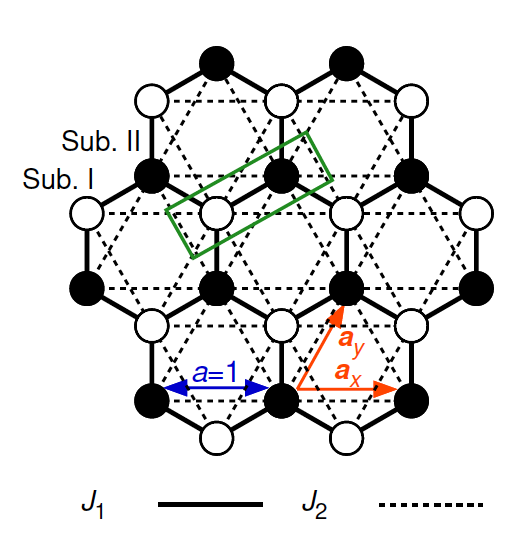 These results are described in the preprint: "Multiple-q states of the J1-J2 classical honeycomb-lattice Heisenberg antiferromagnet under magnetic fields" Tokuro Shimokawa, Tsuyoshi Okubo and Hikaru Kawamura, arXiv:1902.01582. The Kronig–Penney (KP) model is one of the fundamental models, taught in almost every solid state classes. Despite its simplicity, it is particularly well suited to describe the behavior of electrons in metals. Assuming potentials at non-periodic positions or having random strengths, the KP model can describe impurities or disorder in a straightforward manner. 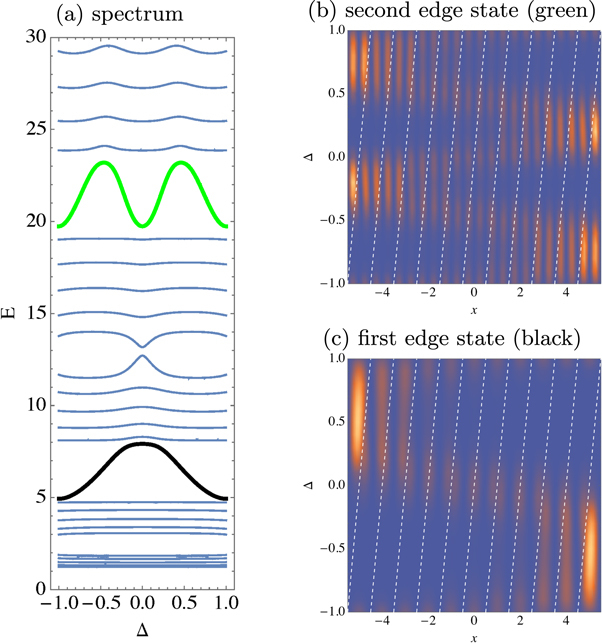 In this work, we use the coordinate Bethe ansatz approach for such arbitrary KP model in finite geometry and demonstrate the appearance of topological edge states. A nontrivial topology is marked by a nonzero topological invariant, such as the first Chern number in the case of two dimensional systems. To have a second periodic parameter that can be considered as a virtual dimension, we apply a shift Δ to the scatterers with respect to the wall of the box. According to the bulk-boundary correspondence, the number of edge modes in the gap has to be related to the sum of the Chern numbers of the bands up to the given gap. In the first gap, we have one edge mode with positive and one negative velocity, located on the opposite ends and corresponding to c1 = 1. In the second gap, the number of edge modes becomes two for both sides, reflecting a total Chern number c2 = 2, and so on. (a) Spectrum of the KP model with equidistant scatterers of alternating heights as a function of the Δ shift. Each band has a Chern number 1. The green and black line denote the in-gap edge modes. (b) and (c) illustrate the density distribution of the edge states across the box. For Δ =-1,0 and 1, the modes are extended and melt into the bulk. For other values, they are localized at the sides of the box. Looking inside matter is not a dream, but an every-day achievement in labs around the world. The scattering of neutrons is a powerful, and broadly used, method to probe the microscopic details inside magnets. Magnetic order, or on the opposite the complete absence thereof, can be easily observed by neutrons. But what about more subtle correlations? A growing number of exotic magnets present complicated features in neutron scattering, due to unconventional correlations. These features often need to be analysed case by case, and it is difficult to find generic patterns. Here, we identify and explain a new pair of generic patterns, with the appearance of a “half-moon” and a “star”. They are the natural consequence of the proximity of a Coulomb spin liquid, emerging from the local clustering of magnetic degrees of freedom. In other words, half-moons and stars appear in systems where flat bands of excitations are not ground state anymore. Being the generic signature for a family of models with flat bands, half-moons and stars are now distinctive features to be looking for in neutron scattering. 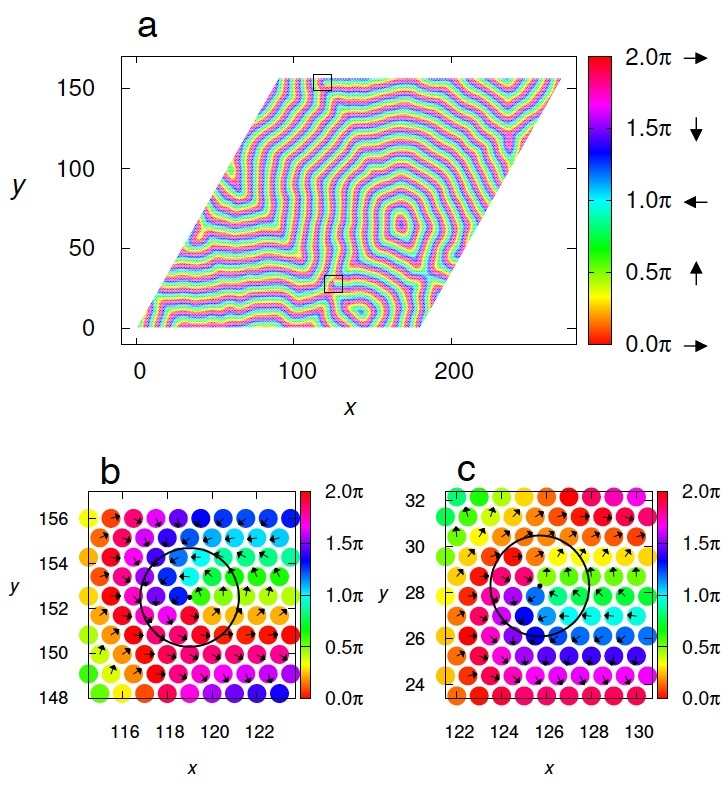 Worm algorithms have been shown as a very useful means of generating non-local updates in frustrated models of magnetism. Here we study the statistical properties of two previously developed worm algorithms for triangular and Kagome lattice antiferromagnets with further neighbor interactions. The ‘worm’ construction typically starts by creating a defect and an antidefect next to each other in the initial configuration. 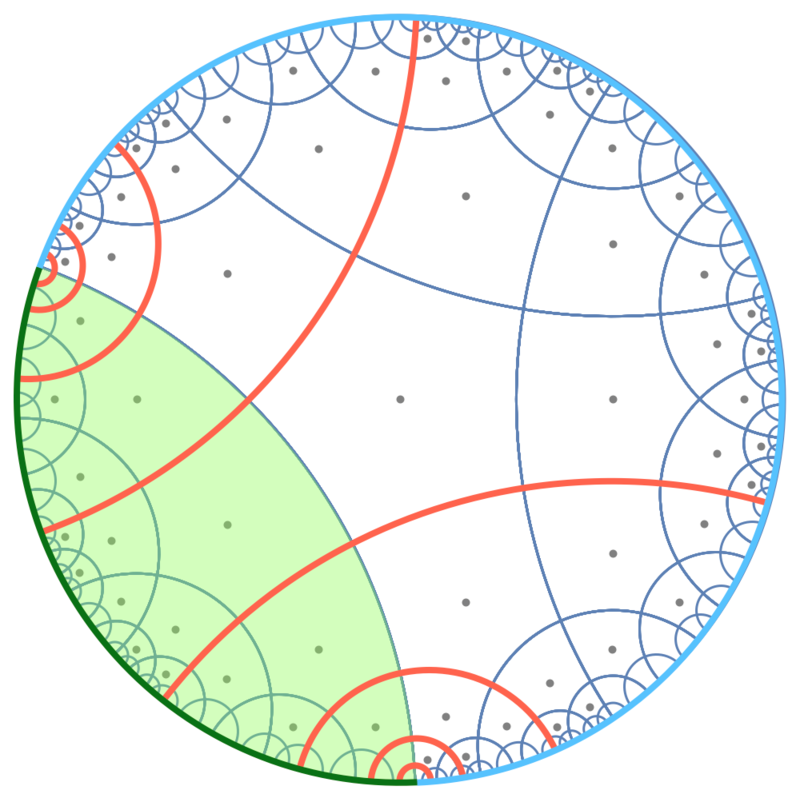 The location of the defect defines the fixed tail of the worm, while the head of the worm corresponds to the antidefect, which is moved through the lattice in a way which satisfies detailed balance conditions in a larger configuration space that allows for one defect-antidefect pair. The construction ends when the head reaches the tail again and annihilates it. All variables encountered during the motion of the worm are updated as a result of this construction. We establish that the statistical properties of the worms depend only on the universal long-distance properties of the underlying equilibrium ensemble, and not on the details of the worm algorithm or microscopic Hamiltonian. First, the walk is conducted in a logarithmic central potential whose strength is set by the power-law exponent of the equilibrium defect-antidefect correlation function. Second, the steps of the walk are correlated. By comparing our measured statistical properties of the worms to expected scaling relations, we establish that the worms define a discrete-time realization of a fractional Brownian motion which has a conventional steady-state given by the equilibrium Gibbs distribution of a particle in a logarithmic central attractive potential. A typical worm propagating through the fully packed dimer model on the honeycomb lattice. A defect here is the lattice site with no dimers touching it and an antidefect is the lattice site with two dimers touching it. The worm ends when the initial defect is annihilated by the propagating antidefect. Magnetic frustration leads to the emergence of diverse exotic behaviors, and the study of their theories and phenomenology is crucial. For example, sophisticated understanding has been established for models with underlying U(1) symmetry and the associated pinch-point features in their spin-spin correlations. However, this turned out to be only half the story. Attached to the pinch points, there exists another highly universal feature in the shape of two “half moons” in a wide range of frustrated magnetic models and recent experiments on Nd2Zr2O7. In this work we establish its theoretical interpretation, which turned out to be a hidden side of the pinch-points. It is a result of decomposition and decoupling of the emergent magnetic field in the system, which leads to an extra pinch point on the dispersive band. The half moons are essentially the pinch points seen on a constant energy cross-section. Illustration of connection between pinch points and half moons. Upper panels: flat and dispersing bands of spin excitations, showing cross-sections at fixed energy (white plane). Lower panels: corresponding prediction for the dynamical structure factor at fixed energy. Pinch-point singularities are encoded in both the flat, and the dispersing band, where they appear as half-moon features. A long term ambition of condensed matter physics is to understand all possible quantum phases of matter. Recently, a new class of so-called “fracton phases” has attracted considerable interest in the communities of condensed matter theory and quantum information. “Fractons” are a type of exotic excitations in the system that cannot be moved by local dynamics. They character new states of matter beyond the conventional Landau symmetry breaking or topological order classification. In this work, a simple classical fracton model is investigated in the context of holography. Holography is a conjectured principle that in negatively curved spacetime, gravitational theory is equivalent to some conventional quantum field theory on the boundary of the spacetime. We found that some of the most essential properties of holography are realized on the fracton model, including how the boundary is entangled, and how the bulk and boundary correspond to each other. This discovery implies a deeper connection between gravity and fracton phase of matter to be explored. The mutual information of a boundary connected bipartition in the hyperbolic fracton model obeys Ryu-Takayanagi formula, a key property from holography. Rich non-trivial magnetic structures in "multiple-q states" have attracted much attention these days owing to their novel thermodynamic ordering phenomena and unique transport properties. 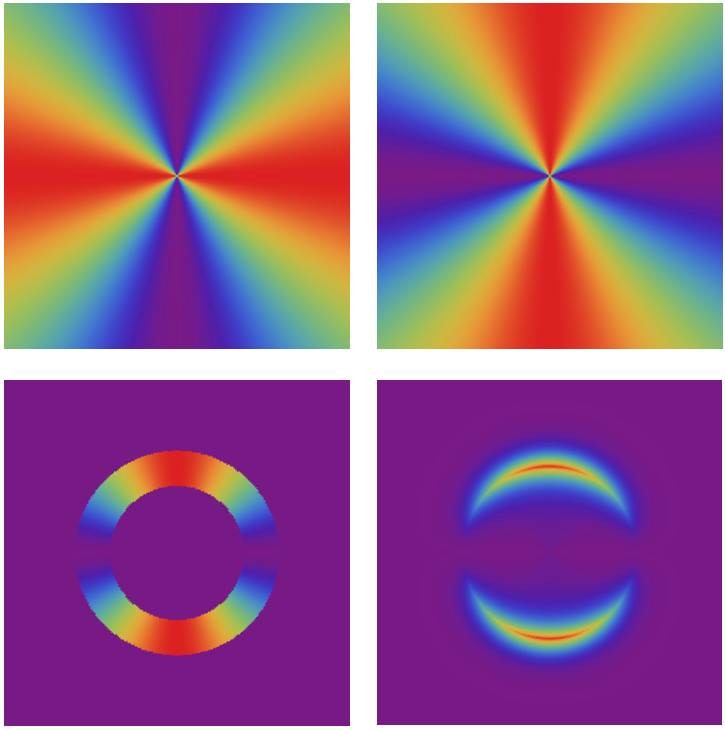 A celebrated example might be a "skyrmion-lattice state" known as a triple-q state with forming periodic vortex-crystal structures. In this article, we have discovered a new type of multiple-q state, a "ripple state" in the J1-J2 classical honeycomb-lattice Heisenberg antiferromagnet under magnetic field by extensive Monte Carlo simulations. This weird state does not form a crystal in spite of the breaking of the translational symmetry and can be considered as an "infinituple-q" state composed of an infinite number of spiral wavevectors. One of the most impressive features in the ripple state is its real-space spin texture which seems to be like a "water ripple" observed when we throw a stone on water surface (see Fig. 1). The interference effect between ripples is also observed and vortex/antivortex defects are detectable (See Fig. 2). We have found that the ripple state appears with a second-order phase transition via a spiral-spin liquid state, “ring-liquid state”. The possible realization of the ripple state in the honeycomb-lattice spin-liquid material Bi3Mn4O12(NO3) is discussed. 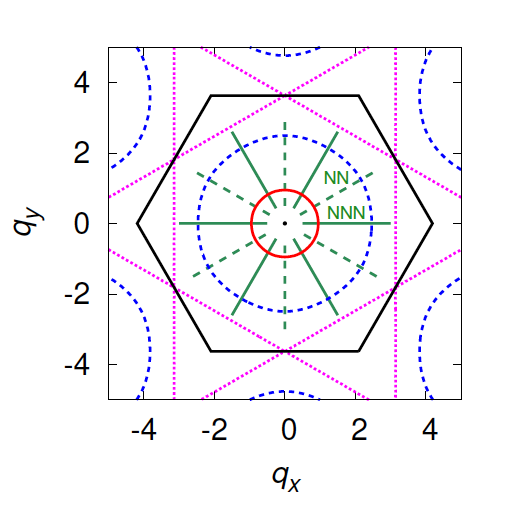 Figure 1 : Real-space sublattice xy-spin texture in the ripple state under open boundary condition. The color displays the angle of the xy spin at each site. Figure 2: (a) Real-space sublattice xy-spin texture in the ripple state under periodic boundary condition. The color displays the angle of the xy spin at each site. (b-c) Focused views of the regions denoted by black squares in (a). Vortex and antivortex pattern are detectable. 9. Hot things expand, right ? Almost every object around us expands when it is heated up, and contracts when it is cooled down. This "thermal expansion" reflects the way in which energy is stored in the atoms which make up the material. In simple terms, the hotter these atoms are, the more they move, and the more bonds between different atoms are "stretched" leading to an overall expansion. Thermal expansion has to taken into account in designing any structure subject to changes in temperature, including buildings, bridges, roads, and moving components in machines. Materials with negative thermal expansion are of technological interest since they can be used, among other things, to compensate for the positive thermal expansion of components with more conventional properties. However they are also very unusual, and perhaps the only common examples are elastic bands, which contract when heated, and water, which expands when frozen. In both cases, the driving force is the driving force is not energy but entropy, a measure of the number of different ways in which atoms can organise themselves. In this study, we report the discovery of negative thermal expansion in magnetic material, Cd2CrO4. Cd2CrO4 is already well-known for its magnetic "frustration", which leads to big changes in entropy, and its unusual properties in high magnetic field. State-of-the art dilatometry measurements, carried out in the High Field Magnet Laboratory in Nijmegen, Netherlands, revealed that, for a wide range of temperatures and magnetic fields, Cd2CrO4 also expands as it is cooled. 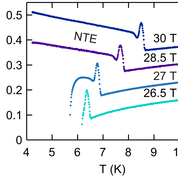 This negative thermal expansion originates in the coupling between magnetic Cr ions and the crystal lattice of Cd2CrO4, and can be explained using a theory developed by Penc and Shannon and Shiba Phys. Rev. Lett 93, 197203 (2004). Change in size of a crystal of Cd2CrO4 as a function of the temperature and magnetic field. The sample shows a marked negative thermal expansion (NTE), which originates in the coupling between magnetic atoms and the crystal lattice. These results are described in the preprint: "Strong spin-lattice coupling and negative thermal expansion in a magnetically frustrated spinel", L. Rossi, A. Bobel, S. Wiedmann, R. Küchler, Y. Motome, K. Penc, N. Shannon, H. Ueda, and B. Bryant, arXiv:1812.05890.